Take a ride on the wild side with a Jeep tour through Aruba’s most scenic routes and beaches. Lots of laughs and rough riding was fun. Lots of laughs and rough riding was fun. Not many my age on board! Probably one of the best excursion of this trip. Great and fun exprience with guide Sergio. Great and fun exprience with guide Sergio. Covered a lot of the island with all of the principal things to see and good information along the way. Could cut the beach stop at the end and allow more time at some of the other place. The best, ride was a blast and the island was gorgeous! 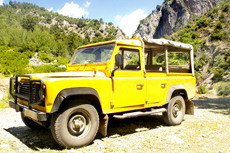 My tour was a 4x4 Land Rover tour through the wild back country of Aruba. My tour was a 4x4 Land Rover tour through the wild back country of Aruba. I got dirty, sweaty, and wet, plus the driver hit every pot-hole. In other words I LOVED this tour ! It was fun ! Not a lot on the island to see if you like history. This was an All-Day 4x4 Jeep excursion. The Jeep tour was awesome - it was a rough roads but so much fun!!! We took a jeep tour that was about 4 hours long. Fantastic, very bumpy but fun. ABC tours booked thru Carnival. ABC tours booked thru Carnival. Rough roads, awesome sites, and a good time. Part of us did the North Coast Jeep Safari and part of us did the UTV Adventure. Part of us did the North Coast Jeep Safari and part of us did the UTV Adventure. Both were excellent and we highly recommend them. Just remember they are very long, extremely dusty and bumpy. Worth every penny. Thoroughly enjoyed the jeep tour. Overall it was great but there was no snorkeling or food provided as the description stated. Overall it was great but there was no snorkeling or food provided as the description stated. Aruba was beautiful and probably our favorite of the four ports. Pretty standard all day tour of the island, which is a rock. Although this company was slightly disorganized with timing they could not have been nicer. seemed like we were taken from one place to another with over priced touristy items... it was ok but nothing I would recommend or do again. ABC tours was a blast! This was really fun. They ended up customizing it for us and we ended up getting to go to 2 different beaches to swim. Good guides and a fun experience! The BEST excursion! Off roading in a Land Rover, hitting every rock, and rolling around that jeep made our teeth rattle and we loved it! Fun crew, gorgeous scenery, dramatic seascape, highly recommended. Fun jeep tour but not real 4x4. Fun jeep tour but not real 4x4. Nothing too rough so really anyone could do the trip.